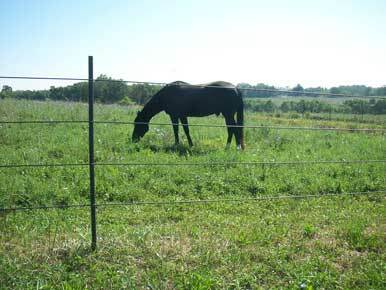 Electric fence offers an economical, attractive and long-lasting fencing solution for horses. With their flexibility, lack of sharp edges and horse-friendly materials, PasturePro posts can reduce the risk of injury to your horse in case of impact. PasturePro posts are flexible, allowing the fence to give with pressure and bounce right back. This flexibility will help protect your horse and your fence in case of impact, and provides a safer alternative than t-posts for horses behind electric fences. PasturePro posts are also shatterproof and made with horse-friendly materials. Watch The Bale Test below to learn more. PasturePro posts install easily and quickly. Made of polypropylene and reclaimed wood sawdust, the posts do not require gloves during handling or installation. Attach braided rope or coated wire with PasturePro rope clips. PasturePro posts come standard in black and white. Custom colors are also available. Give us a call at 1-888-563-6771 to place your order. The Bale Test shows how PasturePro posts yield to pressure without shattering. Give us a call at 1-800-563-6771 M-F 9:00am-5:00pm CT, submit your question to the contact form or request samples.